The Vauxhall Adam is available in any colour so long as it's black or white. It's slick, full of tricks and packs a techtastic punch despite puny proportions. It even has Siri voice control. It's a limited-edition model of Vauxhall's oddly named new supermini, the Adam. But with its ying and yang aesthetic (there's an Adam Black to go with the White) and full-on smartphone integration, Vauxhall is hooking into the cult of iPhone both literally and figuratively. Taking the 'smartphone on wheels' concept to the next level is what the Vauxhall Adam White is all about. That starts with aping the iPhone's traditional black and white colour options. Except, of course, the iPhone 5S is now silver, gold and space grey. Whatever. Still, that doesn't detract from the other part of the smartphone angle, which is handset integration courtesy of Vauxhall's snazzy Intellilink multimedia system. We'll get to the details momentarily, but the basics involve media playback, app support and more. The rest of the Vauxhall Adam White proposition boils down to a trim package based on the existing 1.4-litre petrol model. There's extensive colour coding, standard sports seats and 18-inch alloy wheels. The usual limited-edition drill, then. One word: Intellilink. It's the feature that will make or break the Vauxhall Adam White's 'smartphone on wheels' sales pitch, based around a seven-inch touchscreen. There's audio playback via analogue and digital radio, USB and Bluetooth. Next up is hands-free telephony, again by the power of Bluetooth, and some basic in-car telematics. But what about navigation? That's where things get interesting because it's part of Intellilink's app functionality. Currently Intellilink supports three apps - two internet radio apps (TuneIn Radio and Stitcher) and the BringGo nav app. These apps display in-car, but actually run on your smartphone. Both Apple iOS and Android devices are supported, but oddly iPhones must connect via USB while Android devices connect via Bluetooth. As for adding apps, that's one of the platform's big weaknessess. It has to be done at your local Vauxhall dealership. That said, the existing apps work well and cover the two most critical next-gen multimedia features, namely streaming audio and internet-connected navigation with traffic data, albeit the latter is a premium service you'll have to pay for. The final added bonus is integrated Siri support for iPhone users including steering wheel controls. Put simply, anything you can normally do via Siri voice control, you can do in the Adam while you drive. 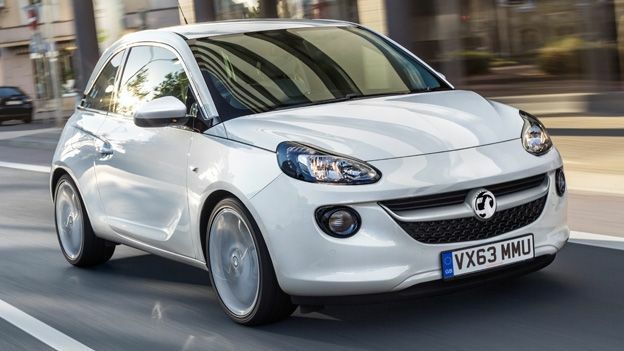 As a driving experience, the Vauxhall Adam White is pretty much off the peg. Like every Adam, the chassis is much grippier, much more responsive than you expect. OK, with just 87hp it's not exactly a piping hot hatch. But this thing really handles and that means you can have a barrel of laughs on your favourite b-road without busting too many speed barriers. Like a lot of the latest small cars, it's a surprisingly comfy and refined long-distance cruiser. Yup, you really live with an Adam as your only car. Vauxhall's 'smartphone on wheels' sales pitch is asking for trouble. Instantly, expectations for integrated tech are high. But the Vauxhall Adam White mostly pulls it off. The Intellilink platform's functionality is a little limited right now, admittedly. But what it does, it does very nicely indeed. It's one of the best multimedia systems in this part of the market, that's for sure. The only bit we don't like is having to pay extra for the navigation app. As for the rest of the car, it's nippy, zippy and a whole lot of fun.